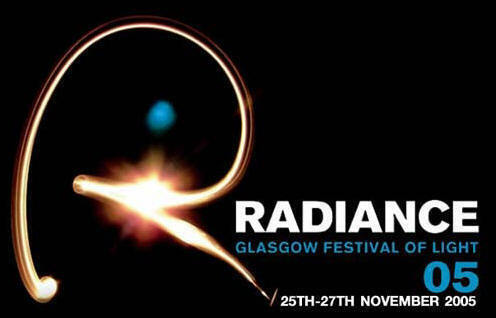 Radiance is Glasgow and Scotland's first major 'Festival of Light'.For three evenings lose yourself in the sheer enjoyment of an inspiringrange of light works by some of the world's leading designers and visualartists, creating a stunning transformation of the city centre. Rediscover Glasgow's remarkable range of buildings and locationsresplendent through original lighting schemes, projections,installations, artworks and events, linked by a flowing trail along itstight network of roads and lanes. The festival can be approached on foot from any direction, childrencan collect stickers from the main locations, so you can take in as muchor as little as you like, stopping for a drink or food as you make yourway around. Radiance is an inspiring way to explore the city as a work of art,finding hidden gems, surprises, subtle as well as monumental works. Developed and funded by Glasgow City Council, as part of theirinvestment into the city's lighting strategy, and organised inpartnership with leading arts and events management companies nva and DFConcerts . "I am so proud to have helped introduce this festival to Glasgow.People love to see the city's buildings being lit up. Now I'm sure theywill be equally as excited to discover Radiance and lighting as an artform. This festival will help put Glasgow on the international stage interms of our lighting strategy."